A couple of decades later, I find myself regularly donating food and volunteering at the food bank. I’ve even written a post on how to help your local food bank. The help that they extended to me in my time of need will never be forgotten. 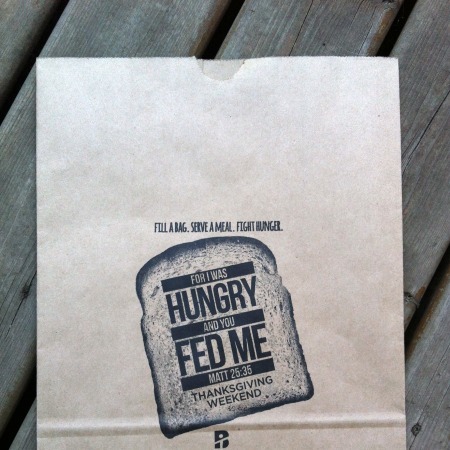 They are encouraging the congregation to fill paper bags with food for the food bank. They’re arranging volunteer times for people to cook and serve meals for the homeless. They have an ambitious goal to raise $30,000 to donate to the homeless and hungry in my city. They want to BLESS others in need. I can make a difference and you can make a difference. Let’s make a difference together… today. October 16th, is World Food Day. Please contemplate how you can help feed the hungry in your community. Also, if you would consider sharing this post? Let’s spread the word about a food bank success story. « « What Will Happen To My Blog When I Die? Thank you for sharing your story! While I’ve been blessed in that I’ve never had to use the Food Bank, I’ve donated my whole life as my parents have given to the Food Bank for as long as I can remember. I’m passing that on to my young nieces, who enjoy going to donate to the Food Bank and telling me they want to help other people. It takes a village to feed a child and you never know when you might need the Food Bank yourself! Bless you! Thank you so much for your kind words Suzi. I struggled with sharing this but I think it’s important to share my “success story” and encourage others to open up with how services helped them as well. I honor your journey and find you to be incredibly inspiring. You are absolutely right about sometimes people just need help, and when that help is available, there should be nothing but support. No judgment, no shame, just help. And we should all help as we can because it could be any of is anytime. Human to human, heart to heart- I love your truth jennifer! Thank you so much for your kind words Rebecca. I struggled with sharing this for fear of judgement… yet here you are encouraging me with love and support. Thank you my friend. Thank you for being so willing to share your heart with us yet again, Jennifer. This can be a contentious issue and people can be very judgmental. Yet, times are tough. While we haven’t needed to utilize our local food bank, my husband and I have had this discussion. We have resolved that we will swallow our pride to feed our children should that time ever come. Like you, we see it as a last resort. In the meantime, we are in prayer for food banks all over the country and the people they are serving. Thank you for bringing awareness to this issue. It is one that concerns me deeply. Thank you for your kind words and encouragement Heather. It’s an important issue and obviously one that’s close to my heart. We’ve been there too. As hard as it was on our pride, especially on Frank’s because he thought he had failed me, us, our family we swallowed it and realized we need to think of our children. Like you, many people don’t know this about us, and we haven’t told anyone… up until now. I do have a post coming out about how we wound up in Croatia and this little tidbit is only a small part of the story. Thank you for sharing your personal experience with utilizing the services of the food bank. It’s so important to encourage one another to get help rather than isolate them for seeking it. Thank you so much for your kind and encouraging words Janine. This was a really hard post to write and share. People can be judgmental. However, I figure even if someone rejects me as a result of my honesty about this, then it’s best I know that they are that type of person now, rather than in years from now. Thank you once again for the encouragement and support… I truly appreciate it. Thank you for sharing your story and what an awesome reminder for all of us! Thank you for reading about this journey Lauren. I’m glad the food bank was available to help you. How wonderful that you’ve served and donated in return. As you said, a wonderful success story! Hunger is definitely a cause near and dear to my heart. Sometimes these personal experiences bring about a desire to make things better for others. It’s definitely a success story… and I hop that by sharing and helping we can contribute to many more success stories. Thank you for your kind words Cindy… and for sharing that scripture too! I nearly didn’t publish this. There can be so much stigma and judgement around these things. I’m glad I can give back too – hunger is a cause that is dear to my heart. Thank you for your kind and encouraging words Chris. I love my church… it really is community focused and makes a huge impact on our city as well as world wide. I think it’s so important to remember that there will be a time in our life when we will need help. And there is nothing wrong with that. And since we will all be on the needing side of things, it’s so great to be on the giving side of things when we can. Thanks for sharing this post! Yes, I hope that by sharing this story, others will share their experience with asking for help… and receiving it. Thank you for your kind words Leilani. Thank you for sharing this, Jennifer. People need to hear these stories and understand that “regular” people need the food bank too. Thanks for the kind and encouraging words Renee. I hope others can share their stories of asking and receiving help in a time of need. I love your honesty and these kinds of posts really hit home with most people because we have all been there, secretly or not! My husband and I have been through some tough times being married at such young ages of 18 and 19, so I have for sure received help. I love giving back and I love this cause, thank you for being brave enough to speak out about it! Thank you Jessica. This was a hard post to publish. It’s amazing how we bury these things for fear of what others will think of us. However, the best way to remove the stigma is to confront it head on. Thank you so much for your kind and encouraging words Rachael. I have an especially sensitive heart when it comes to the hungry – I feel blessed that I can now bless others by helping the hungry and homeless in my city. I love the Food Bank and have been both a recipient and donor throughout my life. I think it is one of the most amazing charitable organizations ever! Thank you for sharing your personal experiences with the Food Bank Jen. It’s such a vital service. I think this is a great and important post. There is a belief that the food bank is for ‘other people’…homeless people with addictions or abused single mothers. The fact is that each one of us could find ourselves in need before we even know it. This post is a great reminder of that – thanks for sharing! Thank you René, yes, there’s definitely some misconceptions about the food bank. It’s so important that we show the truth that the Food Bank is a service that can be accessed by anyone… and there should be no stigma attached to it. Happy to spread the word about World Food Day. Thank you for sharing your positive experiences with supporting the food bank. It’s such a vital service. I started using a food bank when I became disabled and had a very limited income and could not work to earn money, just a bit even, for food. So, here I am with three degrees (BA, BA, MA) and need a food bank. Fortunately, there are about 20 in this county. I can go to whichever I choose, but NOT all of them. I am not proud of this. Sometimes, I feel like a failure, but I know I am not! Thank you for sharing your personal experience with the food bank. It’s such a vital service. Thank you, Jennifer, for hearing your story. I think that, sometimes, we do think services like the food bank are for “other people.” Hearing stories like yours makes it real and makes us realize that ANYONE can need those kind of services at different times in our lives. Our church is getting ready to kick off and outreach project with our children in which we will be focusing on heaping to relieve hunger for the next 3 months my collecting canned foods for our local food bank as well as collecting money for a variety of projects that feed hungry people in our city. Thank you for your kind words and support Lisa. I love hearing about churches and organizations helping the food bank and the community… that’s wonderful! So proud of you for sharing your journey. This is something close to my heart as my husband was raised by a single father and they had to rely on food stamps for their food. Their is a lot is stigma but unless you have been in the persons’ shoes their is no room to judge :) Great work! Thank you Katie! I’m so glad I published it. I hesitated for fear of judgement but that’s how we keep people thinking and believing the wrong things… by never speaking up and never sharing our stories. I appreciated hearing your perspective. Thank you! So glad you shared your story. We received assistance from WIC when we first had Scarlet. It was hard to admit we qualified, and hard to admit we used it. They were hard times and things are better now, but I always remember the help we got and we try to pass our help along. Thank you for your kind and reflective comment Tamara. It’s such an important service. Thank you for being open and sharing! Such a great reminder to really get involved in our communities, especially if we’ve been given more than we need. Thank you Julie – yes it’s a vital service and I feel fortunate to be able to give back to such a vital cause. Thank you for bravely sharing your story. In my line of work I see families of young children struggling each and every day to keep food in their bellies. I love Food banks and the safety net they provide for so many. Thank you for your kind and thoughtful words Robbie. The food bank is such a vital service. Hi Jennifer! What a story! I’m so glad that the Food Bank workers were so kind to you, imagine how you would have felt if they abandoned you? Our church has a food bank that is open three days a week. We do donate food and paper goods, and support it with money too. I think you have a more immediate perspective because of your experience. It gives you a tender heart because you can see yourself in the clients of the pantry. Good for you for giving back, and encouraging others to do the same. It was brave of you to share. I admire you for that! Thank you so much for your kind words Ceil. I feel very blessed that I had the Food Bank at that time in my life. It really has had an impact on me. I loved hearing how your church helps feed the hungry. That’s awesome. The postman and I both had to wipe a tear after that. It was lovely that no stigma was associated with it, no judgement. The simple act of helping others made our little girl so excited. Jennifer, thank you for sharing this because it serves as a wonderful, heartfelt, and close-hitting reminder to each of us to support others without reason or judgement. Thank you so much for your kind and encouraging words Sarah. I love what you shared about your daughter… that’s precious. Gee, another amazing post! I’m glad you posted this topic because it really raises the importance of what the food bank in whatever area of the country you are in does for people. There’s no shame in having to do this, especially when hard times can befall us all. I know quite a few people who have made use of their church’s food pantry — one lady I know said that she had to make sure they paid their mortgage first and not think about anything else until her husband was able to get a job. It really makes me want to find a place to contribute. I’m so glad you enjoyed this post. It was a challenging one to share. As I indicated, I hadn’t shared about this before… but it’s such an important topic and a vital cause. Awesome post! I feel like people can be so judgmental when it comes to people accepting ‘charity’ or assuming everyone who gets some kind of assistance is just cheating somehow. God bless you for sharing this, I hope other women and their families who need help will have the courage to seek it! Thank you so much for your kind and encouraging words Stephanie. No need to be ashamed! You used it for what it was designed for and even better – you are continually giving back to help others who need it! That is wonderful! We never know when our experiences will be “called upon” later on in life. My experience with the food bank makes me passionate about that cause. I would think that’s God at work. Thanks for your kind words Chelsea! This is such a wonderful post! I’m so glad you shared this story. It’s such a great story of the importance of services like the food bank. The food bank helped you get through a tough period of time and now you are the one giving back. I hope to show my son the importance of helping others out. You never know when you’ll need the favor yourself. You’re right Tricia, you never know when you might need these services. I like to contribute whatever I can. Thank you for your kind words and for stopping by today. How amazing that you posted this. There is a girl at my church who is pregnant with her third child. She has two babies 1 & 3 and both in diapers. She left an abusive home and is starting over with nothing. 4 years ago… I left a similar situation with two infant twins and know how it feels to have nothing. I help because I’ve been there. I had food stamps, I had WIC. I felt ashamed to admit it and even still do, but I did what I needed to do to get my babies out of that home. I applaud your honesty and support your cause. Wow, thank you so much for sharing your thoughts, experience, and perspective on this. We should be able to ask for help, whenever we need it, and to do so without judgment. Thanks for your kind and encouraging words. Thanks Kristy. This one was a challenging one to share. However, the only way to stop the stigma is to share about our personal experiences in asking for help. Thank you so much for sharing your heart warming story as it was definitely an inspiration to me. Your willingness to be vulnerable and so very transparent is a huge blessing to all who read your article. No judgment here. I used to be very embarrassed as a child when we had to go to thrift stores to buy secondhand clothing, but it’s so amazing when as an adult rearing three small children I chose to go to a thrift stores simply to be thrifty, not because I couldn’t afford to buy new clothing. Everything comes full circle. Bless you for sharing your life lessons and being open so that others can learn to. Thank you so much for your kind and thoughtful comment Carol. We do thrift store shopping too. It seems practical considering how fast my kids grow out of clothes! Wishing you a blessed weekend as well. Thank you for sharing your story. I know it wasn’t easy but maybe for someone reading your post – it gave them the courage to accept help…whether through a food bank or from their church, a friend or family member. Life is just hard sometimes. I have a terrible time asking for help but am grateful that others have known how to help when I couldn’t ask. Thank you Andrea. It was a tough post to write but I’m glad I shared and I hope it does help others. Thank you for sharing your story. I think it takes a lot of courage to admit when you need help, and to share parts of your past. I believe there is absolutely no shame in using a food pantry, or any type of social service, when you need them. That is exactly why they exist! Stopping by from SITSBlogging. I’m so glad you enjoyed this Bev. It was a tough post to share but I’m glad I did so. I appreciate your kind words and encouragement. I can imagine how hard it was to share something so personal. Kudos to you and I’m glad things are better! This was a challenging and emotional post to share but I did it with hopes to make a difference for others. Thanks for your visit and for sharing such kind words. Yes Sarah, that about sums it up in one sentence. We never know who’s in need. Thanks so much for sharing your story. This could happen to any of us – and it’s good to hear a personal story! I have donated money every month to our local foodbank – such a simple way to give back, and so helpful. Our food bank prefers money donations to food because they are able to buy in bulk. Thank you again for sharing :)! Thank you Lana. I think it’s important to hear how our contributions could help someone in need. Thanks for sharing how you support your food bank. I admire your vulnerability and am so glad you shared this with us! What a beautiful reminder how the food bank can help and impact someones lives and I love that you can now give back!!! Thank you Caroline. You never know who will need (or has needed) food bank services. The food bank is one of my favourite charities and it’s no doubt because of my personal experience with it. Thank you Sarah — yes, I needed help and I’m happy now that I can give back and help others. Jennifer, thank you for sharing this with us. You’ve inspired me (yet again) in a few things I want to teach parents on my own blog. Funny thing is, we had the most wonderful holidays this year…and yet Kathilynn and I were praying for food in the house. We are still living day by day, one step in faith at a time, working as one mind, one heart in this family. In the process of trying to help someone else, a food bank placed exactly what we needed at the very moment we needed it last week. How’s that for a miracle? Truth is, one of the most beautiful angels I ever had the honor of meeting was a near toothless, chain-smoking alcoholic woman with a heart of gold. I’d gone from making six figures to near homeless in a matter of months when the economy dropped. Someone wrote into a radio station about our family during the winter. We were desperate. Names weren’t given, but we received a letter in the mail–given vouchers for food, diapers and blankets. What’s odd was the location helped the adult homeless. Families didn’t come there. When Kathi, who was 7 months pregnant, walked in with me, we stuck out like a sore thumb. One homeless gentleman hit another with his hat so my wife could have a seat on the stairs (they didn’t have any chairs). What I remember most was when this darling woman reached out over the desk and grabbed my arm as we got up to leave–our vehicle was literally FILLED with goods they never knew how to move (diapers, wipes, kids clothes, shoes…and food). I nodded, feeling very uncomfortable, but she gripped my arm harder. There are amazing heroes in this world, Jennifer, and I’m SO delighted to hear you’re one of them. What a wonderful story you shared here Jaime. It sounds like that woman had a strong impact on your life… and I’m certain she’s touched many lives. Sometimes we need to ask for help. I wish our society embraced it more rather than shaming it. It’s my hope with stories like your and mine, people can see that struggles can hit any one of us– and that we need to encourage and support one another. So thankful you posted this. Our church works with our food bank and I don’t give enough. I will give. Blessings to you. Thank you so much for sharing this wonderful article! You always have a lot to teach and share with your wonderful readers. I am very grateful for this story. Hugs and kisses from miles away.